Back at the castle, Jareth explains to Sweet Baby Toby that the fruit he gave to Hoggle will cause Sarah to forget her purpose. In the very next scene, as Sarah starts feeling peckish, Hoggle gives her the fruit and we immediately see the effects take place. There was absolutely no reason for Jareth to explain the movie to us. We're smart enough to understand the hallucinatory effects for peaches! We aren't all stupid babies! Hoggle ashamedly runs away as Sarah collapses from her killer buzz. Jareth unleashes some more of his balls which float like bubbles to Sarah's resting spot. Sarah is so out of it that she doesn't find it odd when she suddenly appears inside the ball which is holding an actual ball! Can you believe she had the audacity to show up stoned? Decked out in a fancy white gown, Sarah ambles through the masquerade party following the soothing tones of Jareth Bowie. Like all 39-year-old men, he plays hard to get as he continues disappearing behind various guests. Her brother is far from her mind. She wants Jareth and nothing more. Finally, she catches up to him, setting a million fan fictions in motion. The sexiest scene in the whole Henson library. It's more alluring than the Koozebanian Mating Ritual. 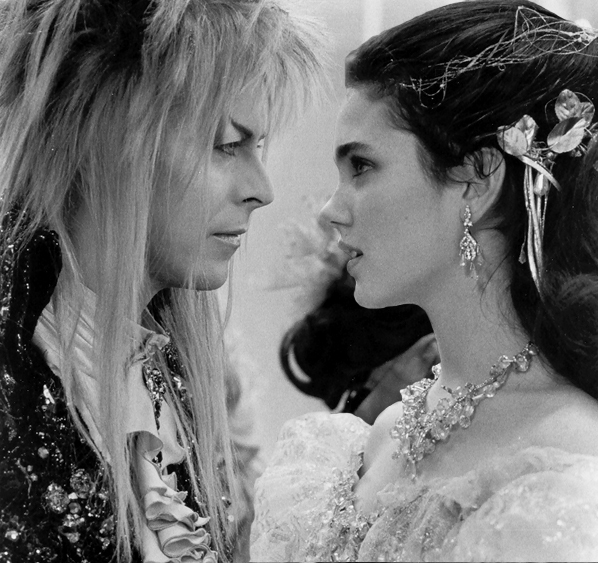 The two dance closely as the lyrics of Jareth's song beckon her closer into his heart. She is almost smitten completely when she notices the clock on the wall. It's nearly midnight, meaning she only has one more hour to save her brother! She breaks free from Bowie's spell which no person in real life has ever managed. She runs from the ball, destroying the glass chamber in the process. It's surprising she didn't leave a shoe behind and jump into a pumpkin carriage to make her getaway. Let's just stay friends. I recently got out of a long-term relationship with an Orc. Sarah's escape deposits her in the middle of the Land of Junk, a vast pile of trash and discarded items. Her friends are nowhere to be found, but a nice bag lady appears to aid in her quest. Sarah explains that she was looking for something but can't remember what it was. The Junk Lady pulls out Sarah's teddy bear Lancelot from the beginning of the film. Sarah agrees that, yes, this is what she wanted. "Football? What's a football? With an unconscious will my voice squeaked out, 'Football!'" The Junk Lady leads Sarah into a cavern which, lo and behold, is actually her bedroom! It was just a dream the whole time! Well, that ending was certainly abrupt and there was no closure to the storyline at all, but oh well, I hope you all enjoyed Labyrinth! The End! Take this moment to spot all the hidden references to the characters and events in the film. But wait, as Sarah goes to reunite with her family, the Junk Lady barges in to her room, telling her it's best if she just stay there. Uh-oh, not out of the woods yet! The Junk Lady starts handing Sarah all of the toys in her room, telling her how much happier she'll be if she just stays put. She is slowly transforming into a hoarder. But no, Sarah realizes that while she once loved her childhood possessions, she will eventually have to grow up and leave the junk behind. Her brother is what is important and so she must venture forth! She breaks out of her room and reunites with her friends, including Hoggle who apologizes for being a jerk and poisoning her. The four make it to the outskirts of the castle, the Goblin City, which is guarded by a Humongous Ax-Wielding Robot! Staying in the bedroom doesn't seem like such a bad idea now, does it? The robot closes in on our heroes, barely crushing them/splitting them in two when Hoggle redeems himself (for like the fiftieth time now) and disarms the goblin controlling the metal figure. He pilots the tin man for a bit before crashing to the ground in a stunt that surely broke all of the actor's ribs. Word that Sarah has breached the castle makes its way to Jareth (who is baffled at the news, despite her shattering his love spell during their last interaction). He rounds up the goblin army to take their positions. The final battle is about to begin! Tomorrow, Sarah faces her final test and the true meaning of the Labyrinth is revealed! Amazing coverage of a classic movie!